The story of the Virginia Cavaliers' 2015-2016 campaign was very similar to their last two seasons: suffocating defense, methodical offense and well, success. The Cavaliers used their pack-line defense to create one of the NCAA's stingiest defenses, and found more offensive success this season, headed by ACC Player of the Year candidate Malcolm Brogdon, steady guard London Perrantes and big men Anthony Gill and Mike Tobey. They wound up going 26-7, finishing off second in the ACC in the regular season and conference tournament, and earning a No. 1 seed for the second time in three years. Yet, for all the Cavs have done under head coach Tony Bennett over the past few years, something they have not done is have any real success in the NCAA Tournament. Virginia has lost to Michigan State the past two years, once in the Sweet 16 and last year in the second round (formerly the third round). While the committee did give them a rather questionable top seed, they gave them no favors by once more putting Michigan State in their field. The Cavaliers are a talented and disciplined team, but I see the same issues on this team as I did the last two years. They don't shoot the three very well, and they just get in fits offensively where they simply can't score. In a region filled with explosive offenses, one has to be worried about Virginia's chances to really go deep. The Cavaliers win a lot of games because they do play such great defense, at one point the offense really has to step up, and even with Brogdon leading the way, I don't know if that will happen, which makes them perhaps the iffiest top seed in the field for me. Lubbock, Texas, is not your first thought for a major college basketball hotbed. Texas Tech has long been a football school, and the program's basketball has lagged way behind some of the region's top schools, such as Texas, Texas A&M, Baylor, SMU and both Oklahoma schools. Yet, Tubby Smith has found redemption at TTU, using a number of timely upsets to work the Red Raiders back into the field, even with a relatively iffy 19-12 mark. The major reason for the Red Raiders' sudden improvement has been their backcourt play, more experience, and a smarter offense. That backcourt is led by veterans Toddrick Gotcher and Devaugntah Williams, who lead the team in scoring. Gotcher especially is a threat other opponents should take notice of. He not only averages 11.1 points per game, he shoots nearly 86 percent from the line and 40 from deep, making him a very versatile weapon. The eighth-seeded Red Raiders will meet Butler in the first round, a team who started off the year flaming hot before struggling mightily in Big East play. Chris Holtmann doesn't possess the magic that Brad Stevens does, yet the Bulldogs have put together back-to-back strong years and should be a tough out in this year's tournament. Much like the rest of the Big 12, Texas Tech is unbelievably inconsistent, and you really never know which team you are going to get on any given night. This team has games where their offense looks explosive and where they play really complete team basketball, and on those nights they look like a team that has legit Sweet 16 potential, and possibly even further. They also have nights where they look out of sorts on both sides of the ball, and their flow just seems completely disrupted. If they can get past the gritty Bulldogs in their first matchup, they have the type of offense and shooting that they could stun Virginia. Though, considering how downtrodden Texas Tech basketball was when Tubby first arrived, just getting to the Big Dance was a major success. Last year, I felt nearly certain that it was Iowa State's year to really breakthrough on the national stage, and make a very deep tournament run. I had them in the Final Four in my official bracket, and even saw them as a possible National Champion in others. Then, March did what March does, and the Cyclones faltered in the first round to an underrated UAB team, in one of the bigger upsets of the year. This year, I think that I have wised up on this Iowa State team, and I can confirm that they are not going to the Final Four. In fact, their first round game very well could end up being on the bigger upsets of this year's tournament. The Cyclones do have a great backcourt in Monte Morris and Abdel Nader, a four-year starter and star in Georges Niang, and forward Jameel McKay, who has moments where he dominates. Yet, this is a team with major deficiencies, the first one starting on the defensive side of the ball. The Cyclones are simply not a good defensive team; they don't rotate well, they don't communicate well and they have no premier, lock-down defenders. That leaves them very vulnerable against one of the Tournament's best offensive teams, Iona, in the first round. Led by electrifying guard A.J. English, Iona has put a beating on opponents all year long. They don't have great size, but neither does Iowa State, which could leave the Cyclones very vulnerable in transition, where the Gaels love to do damage. If Steve Prohm's Cyclones do make it past Iona, they will get a tough meeting with a hot Purdue team or sneaky Arkansas-Little Rock, and even greater tests await further on. I think Prohm has the program moving even closer to true national relevance (which is an extremely difficult job, considering how great Fred Hoiberg was), but this team has too large of issues to overcome, particularly in the toughest region. As great as Tubby Smith's redemption has been at Texas Tech, perhaps even greater has been Kevin Williard's story at Seton Hall. The Pirates had been beat up for years in the old Big East, and Williard likely entered this year with one last chance to save his job. All the Pirates did after that was go 25-8, finish third in the conference in the regular season then prove just how good they truly were by winning the Big East Tournament, knocking off Villanova. The Pirates are led by Isiah Whitehead, a former big-time recruit, who has not disappointed since he stepped on campus. Whitehead's great size and strength allow him to get to the rim and finish consistently, and smaller defenders stand no chance. UMass and Western Kentucky transfer Derrick Gordon has played big minutes as well next to Whitehead, while forward Angel Delgado leads a frontcourt that is one of the best rebounding teams in the nation. Williard gets the team to play with so much energy, and it's a Seton Hall team that is just so much deeper than in year's past. While the Pirates enter this year's Tournament as one of the nation's hottest teams, they have a tough road ahead of them. Gonzaga is perhaps the most difficult No. 11 seed, considering their talent and experience. After that, dates with Utah and likely Michigan State could be rough. Yet, Seton Hall has the talent and playmaking to really make some noise and prove they prove they are a program on the rise. 1 Virginia over 16 Hampton... Hampton won 21 games and the MEAC this past season en route to a second straight NCAA Tournament berth. Much like last year, their time in it won't last long. 8 Texas Tech over 9 Butler... If Williams and Gotcher can hit some big shots, and the Red Raiders can get an advantage on the boards, they should be able to get out in a close one. 5 Purdue over 12 Little Rock... The Trojans are a very sneaky team, but they don't have the size to matchup with Purdue's A.J. Hammons, Vince Edwards and Caleb Swanigan underneath. 13 Iona over 4 Iowa State... Unless somebody on ISU steps up in a big way defensively, A.J. English and Iona could have a field day. 6 Seton Hall over 11 Gonzaga... Sston Hall has the advantage in the backcourt, Gonzaga has the advantage up front. If the Pirates can get out and finish in transition, they should be able to sneak by. 3 Utah over 14 Fresno State... Prior to a 30-point loss to Oregon in the Pac-12 Championship, Utah was playing great basketball. Led by Jakob Poeltl down low, they should still have enough to get past the Mountain West Champs. 10 Syracuse over 7 Dayton... Dayton has been very dangerous in March as of late, but is trending in the opposite direction lately. Without too many great shooters on their roster, they could have some problems against Syracuse's 2-3 zone. 2 Michigan State over 15 Middle Tennessee... Middle Tennessee, coming out of the C-USA, probably won't be this year's UAB (who also came out of the C-USA). They don't match up well against Sparty whatsoever. 1 Virginia over 8 Texas Tech... The Cavaliers will be on upset alert in this one. But, Tubby Smith's teams tend to really struggle against great defensive teams, and Virginia could lock down the Red Raiders. 5 Purdue over 13 Iona... Purdue is playing great basketball, and Matt Painter preaches great, aggressive man defense. That defense should be enough to slow down the Gaels' offensive attack. 3 Utah over 6 Seton Hall... Even if Seton Hall can get past Gonzaga's bigs, they might not be able to do much against Poeltl and forward Jordan Loveridge for the Utes. 2 Michigan State over 10 Syracuse... Jim Boeheim versus Tom Izzo is always a treat, but the Orange don't have the depth needed to compete with MSU for 40 minutes. 1 Virginia over 5 Purdue... This one should be very interesting; both teams play great, sound basketball and it could be a real slugfest in the lane. It remains to be seen, though, if Purdue has a defender that can stop the versatility of Malcolm Brogdon. 2 Michigan State over 3 Utah... 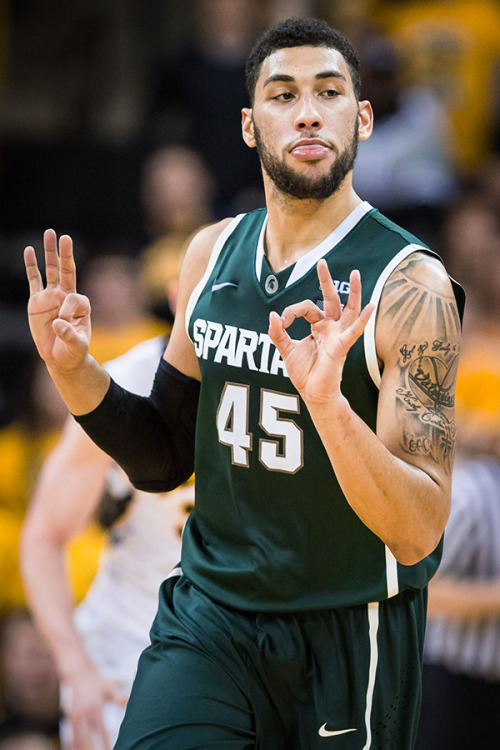 Even if Poeltl plays well down low, the Utes are going to have a very tough time containing MSU's backcourt of Denzel Valentine, Eron Harris and sharpshooter Bryn Forbes. 2 Michigan State over 1 Virginia... The nightmare continues for Virginia, as the Cavs just simply can't get past Izzo and the Spartans. They just don't have enough athleticism or playmakers to do enough offensively against the Spartans, who are my national title pick.